Don’t have enough bees in your yard? Get your own!! Mason bees and all their supplies are in stock now at Bark and Garden. Mason bees are a non-stinging solitary species that come out in early spring and are absolutely CRUCIAL to fruit tree pollination. If you have fruit trees in your yard or just want to create a good habitat for bees, mason bee larvae and homes are an excellent and easy option. You can also attract and keep these wonderful pollinators in your yard by planting early spring annuals and perennials in your landscape. Not only do they attract beneficial insects but they give you something beautiful to enjoy in March and April. Bark and Garden has all the supplies you need to get and keep Mason Bees including the bee larvae, block bee homes, hoods and flowering plants. We even have fruit trees, if you haven’t started your home orchard yet. The orchard mason bee, Osmia lignaria, is an effective early pollinator native to the Western US and Canada. It emerges in the spring, before honeybees. As a pollinator, it is far more efficient than the honeybee by transferring more pollen and visiting more types and numbers of flowers. The male mason bee does not sting. A female is considered non-aggressive; she stings only when handled ‘roughly,’ or when trapped under clothing. Mason bees are solitary. They do not produce honey. 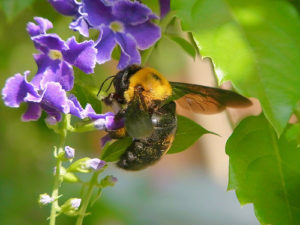 Adults feed on nectar and collect pollen and nectar to feed their young. In contrast, wasps also feed on nectar but must hunt for meat to feed their carnivorous larvae. 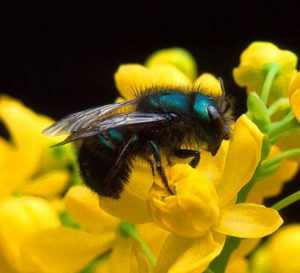 A mason bee looks like a small black fly, but flies only have one pair of wings and bees have two pairs. Mason bees are slightly smaller than honeybees. They fly only after air temperature warms up to about 55 degrees F.